STOP AND READ: This rental is only maximum 10(ten) guests. If you will be up to 18 guests, you MUST rent the unit below which is for 8 more guests. Listing number 4156509. Name of second rental is "Las Palmas Beach Front Condo 1"
Every detail was carefully selected and quality crafted. Highlights include Lu-tron light and shade systems,, concrete first-level and hallway floors, teak wood bedroom flooring, troweled plaster walls and ceilings, artwork display lighting, hidden mechanical, a climate-control system, and spacious corner rooms that overlook the Sea of Cortez for you and your family to enjoy and just 5 to 6 minutes from downtown and 15 minutes from San Felipe's professional Golf Course located in La Ventana Del Mar.. The whole complex is always nice and cool thanks to its modern A/C will have access to the beach as this is a front beach condo, where there is small flight of stairs that lead straight down to the sand and the refreshing ocean. You will be able to cook up delicious meal with the patio BBQ that is also shared by guests from condo 1. This unit is equipped with 3 bedrooms and 2.5 bathrooms, first bed has a great King size bed with a couch included, second bedroom comes with a queen size bed also includes a couch, Third bedroom has huge king size bed with alot of extra room for an air mattresses if brought, This unit is a comfortable stay for 10 people. **This unit has only street parking available. NOTE: Be sure to bring your own towels as they are not provided in this unit. Ny name is Erick and I run MySanFelipevacation rental homes in San Felipe, Baja California, Mexico. I'm originally from San Felipe. I moved to the US as a kid and went to school in Oroville, California. I moved back to San Felipe, got married and have two beautiful kids. Growing up in the US, I learned a lot about the high standards guests expect and have brought this experience to all properties I manage. My listed homes are owned by Americans and Canadians who visit once or twice a year. When owners are not in town, the home is available to reserve. Each home's decor is unique in that it reflects the owner's style. My goal is to help you enjoy San Felipe to the fullest. When you reserve any of my homes, I will send you an email with a list of things-to-do both locally in San Felipe and some which are day trips. (I am not able to share this with you now as this site does not allow adding website links). Depending on the length of your stay, you get to chose which you'd like to do. One of the trips I recommend is doing a fishing trip to Konsag essentially a fishing and sightseeing trip. All this and more will be in my list of things to do email. One question I get pretty often is whether we use non-toxic cleaning products while cleaning properties I manage. The answer is YES . We use organic cleaning products sourced from the local Prolisa organic store. Our guests appreciate this and it is also better for our cleaning crew who regularly come in contact with the cleaning products. During your stay, please do not hesitate to contact me with any questions or if you need tips. I look forward to hosting you. Proximity to the beach can not be beat. Equipped with all essentials. Guest provide all cooking amenities. Dining area has seating for six. Adjacent bar has seating for many more. No Kayaks provided, but you can rent these in downtown. Or bring your kayaks and conveniently set sail right in-front of this rental. Rent fishing in boats in town. 18 hole golf course located 20 minutes away. STOP AND READ: This rental is for maximum 10(TEN) guests. If you will be between 11 and 18 guests, you MUST also rent the 2-bedroom unit below which is for 8 more guests. Listing number for lower level unit is 4156509. Name of second rental is "Las Palmas Beach Front Condo 1" Renting the 2nd lower level unit is a separate reservation. Please ask if you have any questions before reserving. Very nice clan spacious house. The beach was very enjoyable and easily accessible Main town with in reasonable distance. Excellent location. Beautiful spacious home! We booked this home very last minute when we visited San Felipe. The owner got back to promptly and we were able to move in the next day. 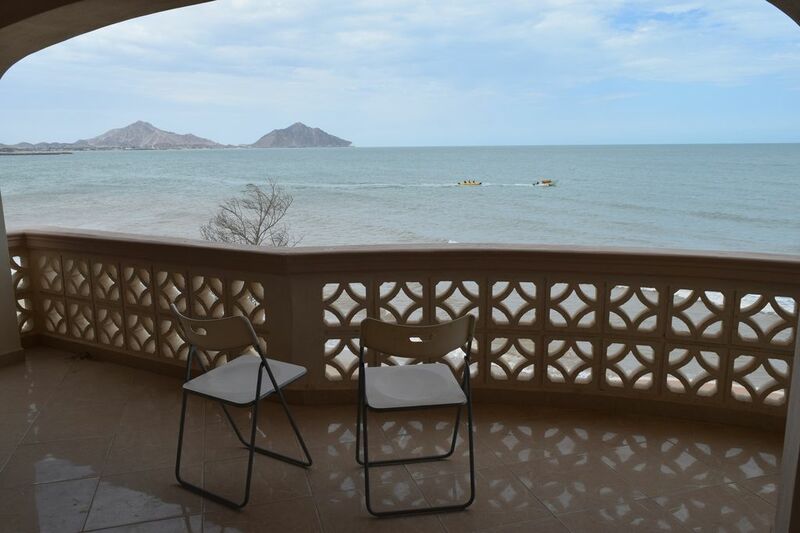 The home has a beautiful view of the ocean and only minutes away from San Felipe. We were very satisfied with our rental. It was perfect bedrooms, bathrooms, wonderful air conditioning and amazing views. From Las Vegas pick up family Mexicali and head to San Felipe it's like having you're private 🌴� beach great Family time. Mexico San Felipe mejor manera de pasarla con Familia. The rental was perfect for our group of 8. The beach views are actually better than what the pictures show. Rental is just a short drive from restaurants, stores, etc. Our favorite thing was to go on strolls along the beach. We also did the banana boat rides right in front of the rental. It really felt like home. Would definitely stay again.